For my mom’s 70th birthday party last weekend we made many appetizers, but I think this was my favourite. The sauce is really yummy, and the prawns were so fresh and huge that they popped when bitten into. Even if you don’t like ouzo, you’ll probably still like these, as the anise taste is quite subtle. I served these as an appy, so I just put a toothpick in each one. They would also work great on pasta. Mmmm, makes me want to make them again! 1. Cook the garlic in the butter for a minute or so, but make sure the garlic doesn’t brown. 2. Add the cream and cook for a few minutes, stirring, until it has thickened up a bit. Add some salt and pepper. 3. Now you have two options: you can either add the ouzo to the cream and cook it off, then cook the prawns, which is the way I did it. Or, you can cook the prawns, then add the ouzo to them and set a flame to them, then add the cream mixture. 4. 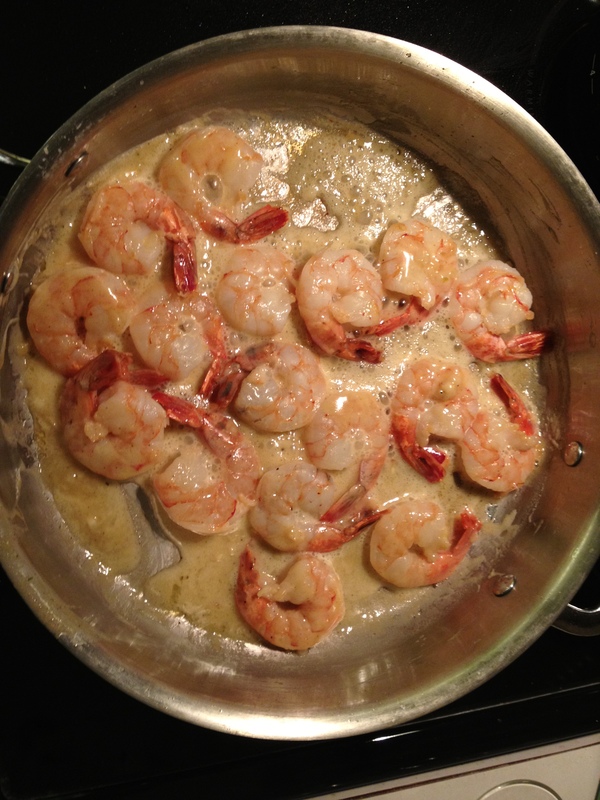 If you chose the adding the ouzo to the cream choice, you may now heat some butter in a large frying pan, add the prawns and cook on each side only until they turn pink. Over-cooking will turn them into tough, unpleasant things. Once they are cooked, add the cream and ouzo sauce, give it a good stir, and serve. Great recipe…unfortunately I didn’t have heavy cream so I used sour cream instead, but because I didn’t make the recipe with sweet cream I don’t know whether it improved it (or messed it up). I also added half a teaspoon of tomato bouillon for color and salt, tasted very good. Will make it again soon with sweet cream. I imagine it would taste quite good with sour cream too. I’ve been in that situation many times, where I make a substitution and I wonder if it made the recipe better or worse.